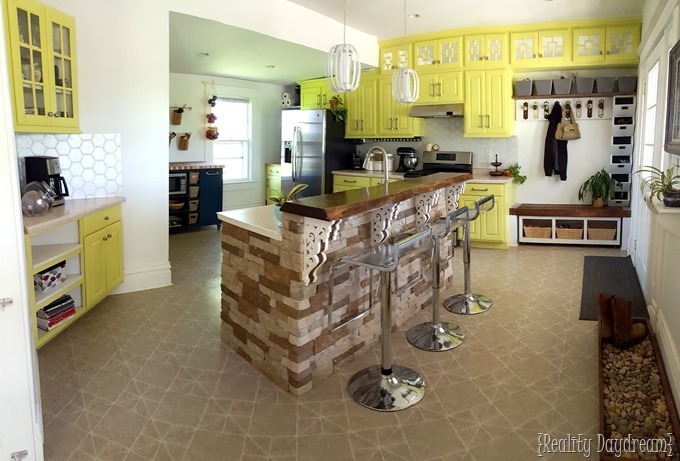 BOLD and Eclectic Kitchen Reveal! I think I can finally say… OUR KITCHEN IS FINISHED. I’ve loved all the changes, but until recently, it just didn’t feel finished. Those old appliances were Nasty with a capitol N. We finally had enough pennies saved to get brand new stainless appliances. (and I’ll just tell you …it takes a LOT of pennies). But soooo worth it. Look at these beauties! I know the bold choice of chartreuse (SW Lively Yellow) for the cabinet color isn’t for everyone. But it’s for ME… and I love it! And it’s a simple weekend project, so when we get bored of it, we can just paint them a new color! I think extending the cabinets up to the ceiling made a huge difference and draws yours eyes up, making the ceiling feel taller than it is! And giving us more storage too. And updating the pulls (these!) added the edginess I was looking for to balance out the rustic elements of the kitchen. 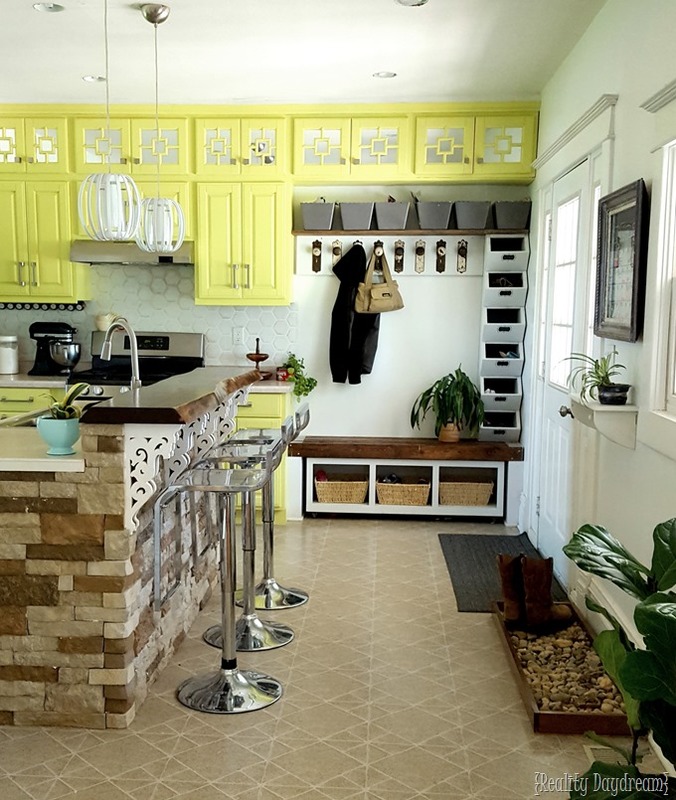 Having our main entrance come right into the kitchen, coupled with the fact that we’re without a mudroom… makes for a cluttered dirty space right in my bright shiny kitchen. But I’ve gone to great lengths to make sure there’s a place for everything. The river rock drip tray for muddy/wet boots and shoes has been a game changer in keeping this entrance at least somewhat dirt free, and gives us a designated spot to throw our shoes. 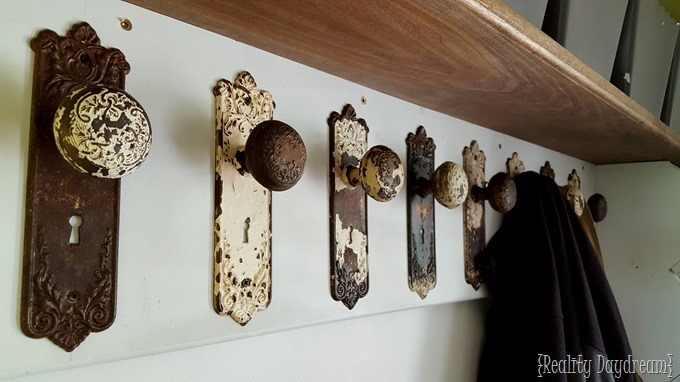 We found these old chippy door handles in the basement of this house when we moved in. SUCH an awesome find! And after some cleaning, sanding, and sealing… they make awesome coat hooks with tons of personality and history. 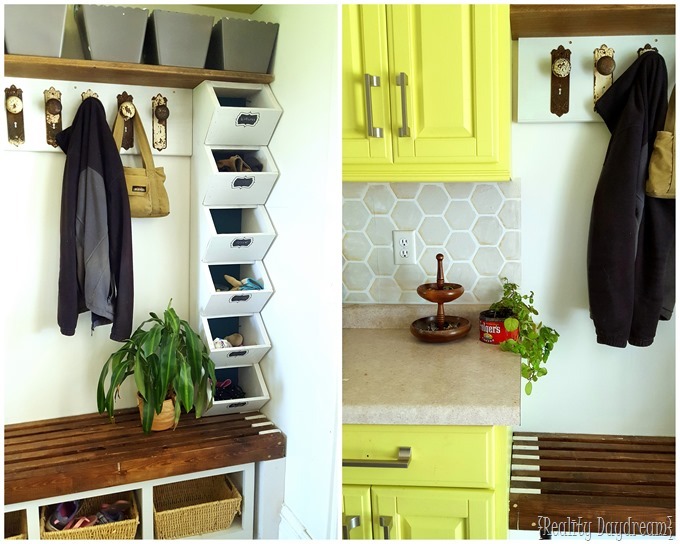 Everyone in the family has their own cubby (Vertical Cubby tutorial here). In the winter they’re filled with hats, mittens, etc. In the summer, they’re filled with sidewalk chalk, bubbles, sunglasses and umbrellas. 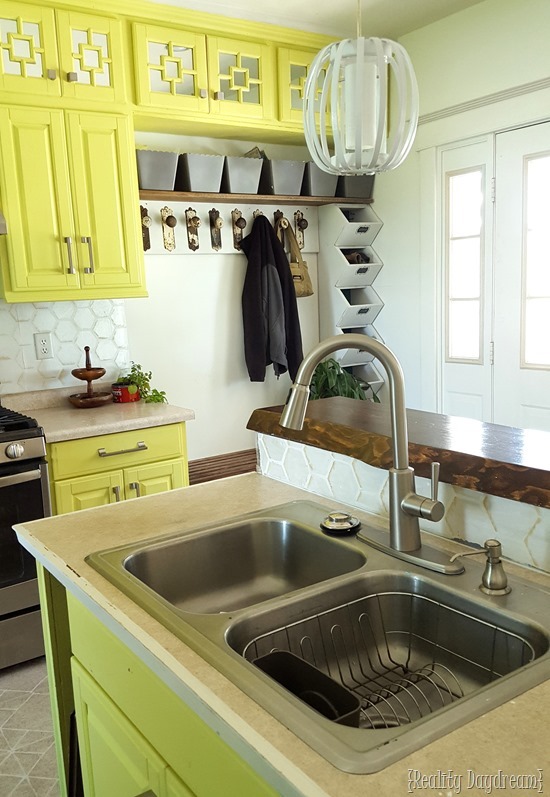 After our appliances were finally installed (and I was so excited to take pics for this reveal post), our kitchen faucet literally broke in two. #ofcourseitdid …so I had to wait even longer to figure out the faucet situation. We were so excited when Moen wanted to be a part of our kitchen reveal, and sent us not only a dreamy new faucet (the Riley Pull-down faucet in stainless finish), they also hooked us up with a beefy garbage disposal (the GX100C Series) …and let me tell you, that thing can grind like a high school senior on spring break at Palm Beach. Dayum. That sucker has a full horsepower, and yet is lightweight and compact for easier installation. Let’s just say Nick was grateful when he was hooking that beast up. It’s also miraculously quiet, so as not to wake the sleeping baby. 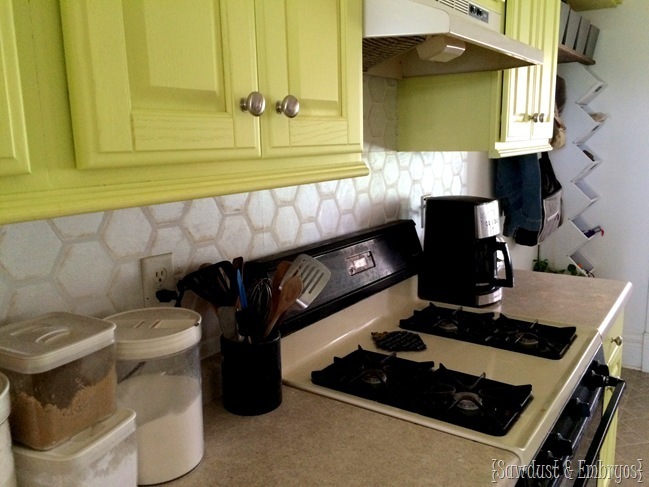 The pendant lights hanging over the island were a DIY using embroidery hoops (more here), and the backsplash was painted /stenciled in that hex pattern (more here). I wanted the backsplash to be subtle with all the other things going on in the room, and I think I pulled it off nicely! Although it’s quite a departure from all the other types of painted backsplashes I’ve done in the past. You might remember how I added on to our island to make a breakfast bar, and used a slab of live edge for the bar surface. 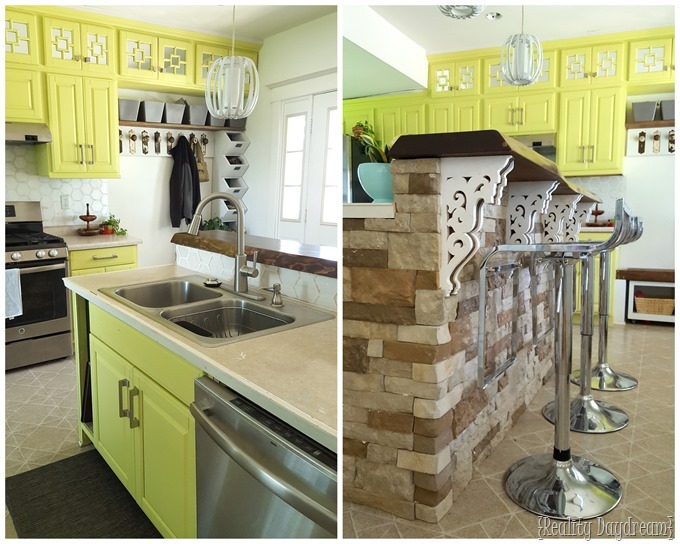 Those corbels were design and built by ME…. and I loooooove them. Easily my favorite part of the whole kitchen! We wrapped the island in AirStone, and finished things off with lucite bar stools (they’ve since been discontinued, or else I would link to them). This pic below is weird because I used the panoramic function of my camera to capture the whole room, but it’s a great angle of the whole island! 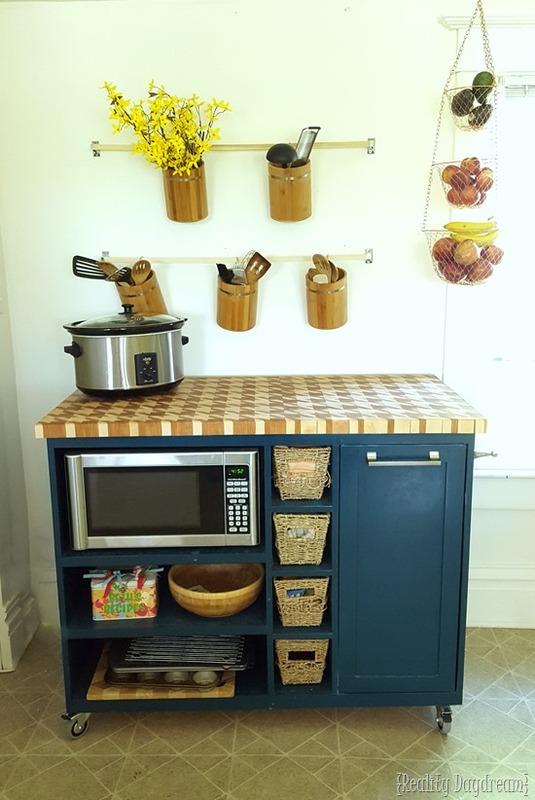 I added the vertical storage for utensils on that blank wall, and we designed and built the rolling island to fit our needs, and it’s amazing! We don’t roll it around very often, but when we do we just unplug the microwave and push the island to where we need it! I also love that the garbage can opens from both sides. We painted this thing ‘Nite Tide’ by Rustoleum, which is the same color I painted our Kitchen Aid Mixer! 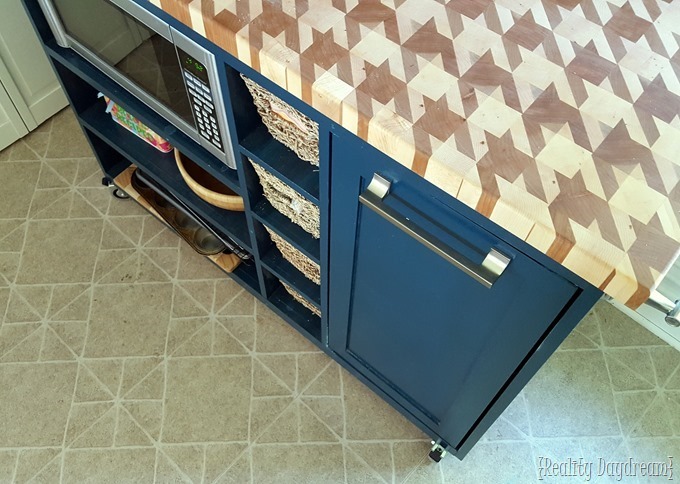 And Nick built the butcher block counter top in houndstooth pattern. It took no less than 17 billion hours to complete. But it’s gorgeous, and you can’t have it. Not only have my tastes changed over the years… so have my photography skills! Haha! But you’ll love knowing that I use my phone to take EVERY SINGLE PIC on my blog. Because ain’t nobody got time to learn how to use a DSLR. Let alone a few grand to drop on a fancy camera. You might also enjoy knowing that when I was cleaning my kitchen to photograph it for this post, I didn’t feel like washing the mixing bowl on my Kitchen Aid mixer, so I just put the dirty bowl back in place on the mixer… complete with crusty cookie dough residue from earlier that day. HAHA! 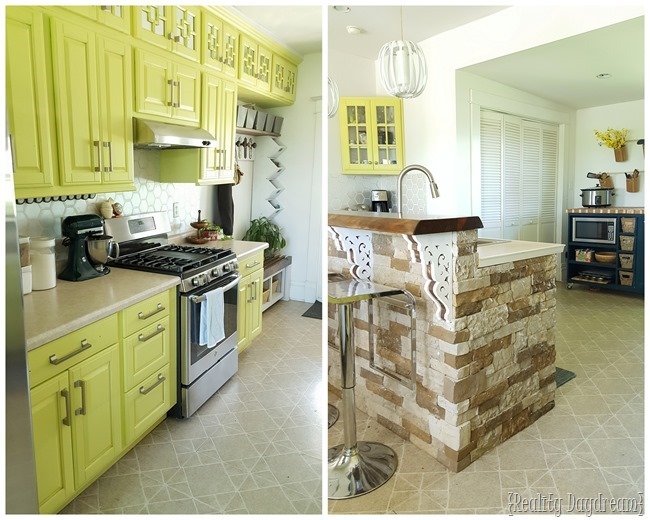 I hope you’ve enjoyed watching my eclectic kitchen transformation over the past year. And I hope you’re able to appreciate all the work that went into it, even if it’s not your taste! My dad always used to say ‘variety is the spice of life’ …we don’t all need to have white kitchens! There are no rules! We can do whatever the bleep we want! Overall I really love this make over but some things throw me off. The board with the door knobs shouldn’t have a gab between it and the kitchen cabinet. I also would have had the faux tile go across the mud area so it doesn’t stop suddenly. Now the island came out great but for me doesn’t fit the rest of the remake. 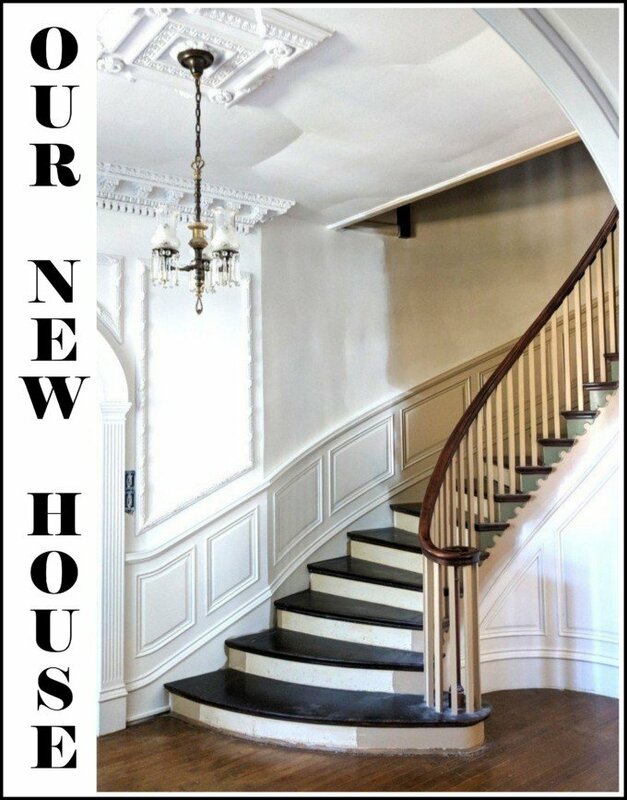 It is too ‘heavy’ and rustic for the new look of the rest of the room and is now more of a wall as you come in the front door. 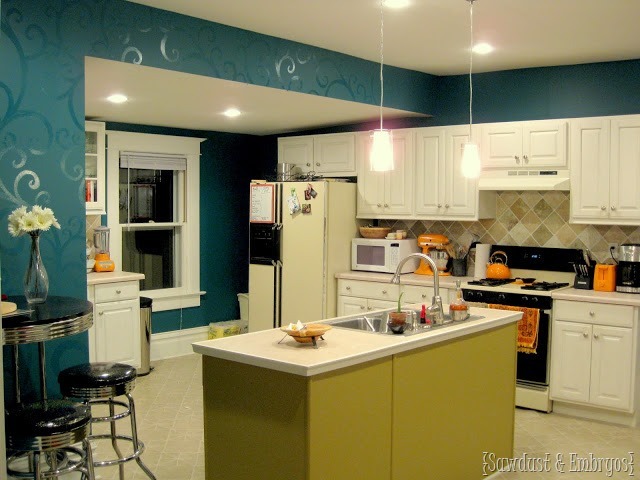 Maybe painted bead board with those pretty corbels you made or pulled the look of the added mirror cabinets you created. 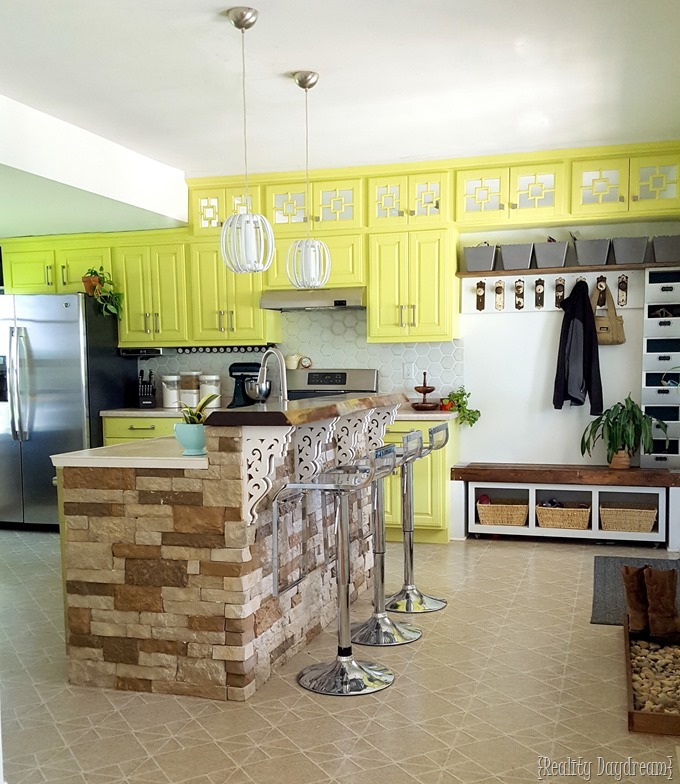 I can’t see the layout of the rest of the room but I think I would have turned the island 90 degrees so it came out of the way that previously had the black and silver high top table so when you come in the door you have more room and no suddenly stopped by the island. It would also make more of a galley kitchen. Love, love, love your kitchen!! I love the color too!! Very “happy”! Very cool! Nick’s wood island counter top is fabulous. 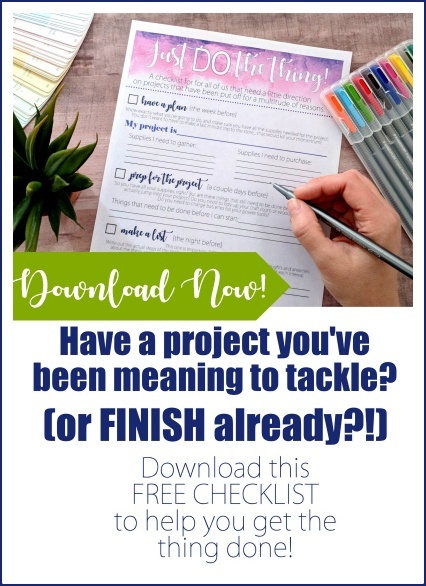 So impressed with all of your projects and creativity! Beautiful! I’d like to hear about how the finish on the cabinets is holding up. It’s holding up beeeeautifully so far. And we just love how durable this paint is. 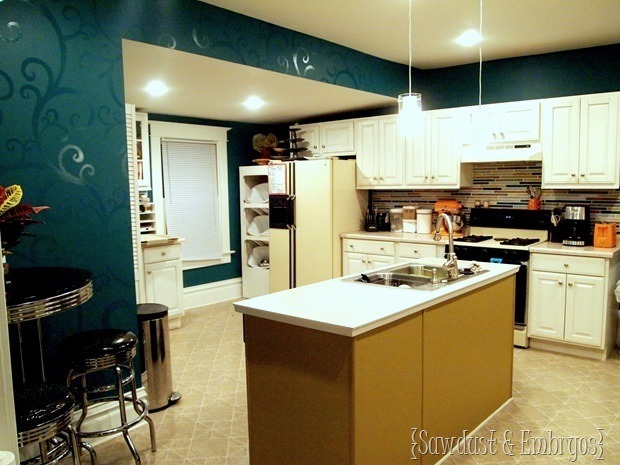 We used Sherwin Williams Pro Classic paint that’s specifically for cabinets / trim / doors / etc in a satin sheen. 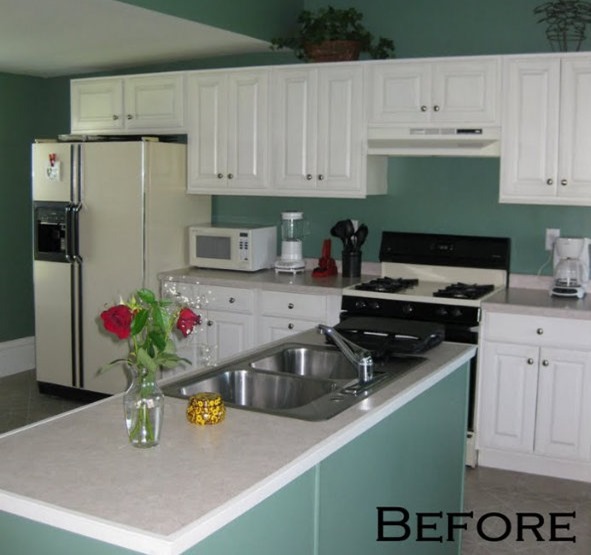 What type of paint did you use on your cabinets? I tried out Ace’s cabinet, door, and trim paint on bathroom cabinets that also took a gazilion hours to make and it’s not holding up. 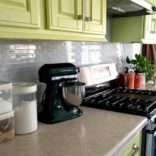 The kitchen’s up next and I want it to look at fabulous as yours! We used Sherwin Williams cabinet / door / trim paint from their Pro Classic line in a satin sheen, and we’re loving it so far! It’s very durable and wipeable. We have no complaints! 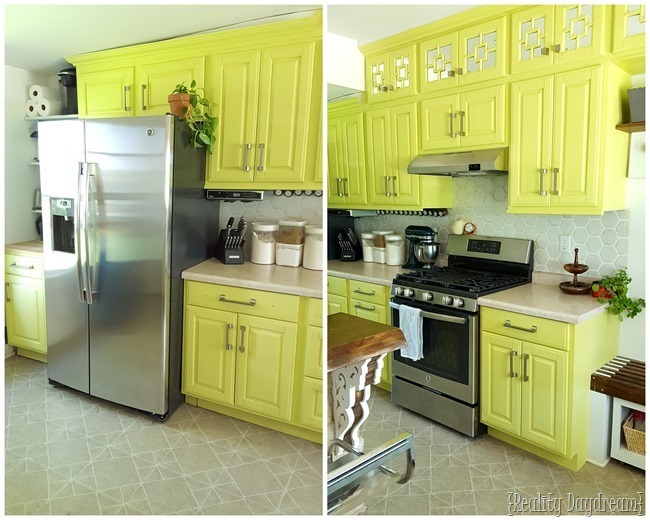 I wasn’t sure about your cabinet color when you did it, but it has really grown on me! I love it! 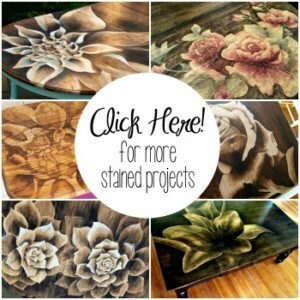 That butcher block top on your cart is AMAZING! Way to go, Nick! Everything about your kitchen makes it yours and it is beautiful. So very, very envious of those new appliances! Great job, Beth! You know what I like best about your new kitchen?? You were true to YOURSELF!!! I happen to love the new look, but your are right, it’s not for everyone. Great job. I hope you and your family enjoy it for a long, long time. So fresh and perky! Be proud, you done good. 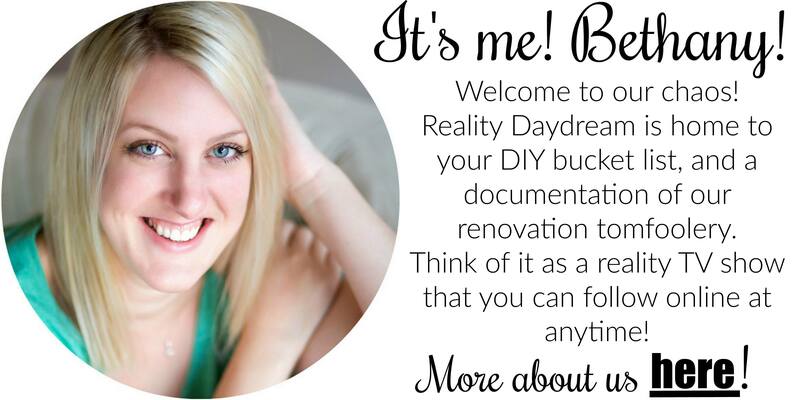 PACKED full of personality, just like you! LOVE. love how bold and unique your space is! it’s so fantastic and such a statement! It looks fantastic!!!! 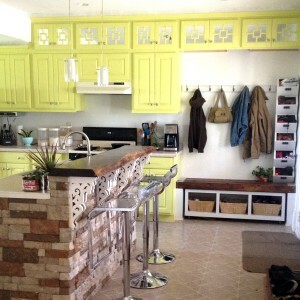 Love Love the cabinets and the color is amazing.